Bethlehem UMC sent a team of four to Guatemala. The team volunteered and lived on campus at the Mi Refugio School in the mountains near Guatemala City. 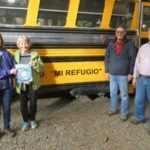 Mi Refugio is an independent Christian school which has been serving poor families in the area for 27 years, providing education from preschool to 9th grade. Some support is available for students wishing to continue their education in trade school and beyond. There are currently 350 students enrolled. The Bethlehem team joined others on the mission from around the US and provided enrichment classes for the students in sewing, arts and crafts, woodworking, computers and baking. Other team members undertook a construction project at the school; adding a retaining wall along a walkway between classroom buildings. Still others were part of the medical outreach mission to the local area seeing many patients who cannot afford medical care or basic medications. Plans are already being considered for future trips!